I have to admit, I wasn’t a huge fan of the rap/rock infusion craze that took over the past few years. The Linkin Park/Jay-Z collaboration was fine (“Points Of Authority/99 Problems” was my favorite) and the unauthorized Nine Inch Nails/50 Cent “In The Club/Closer” mash-up was a crowd pleaser, but neither were ground-breaking (see trendsetters Run DMC & Aerosmith). But last week, on two occasions, I read about a forum where indie rock was blended with rap. My new musical passion, combined with the genre I grew up with and promoted countless times, no way? I thought I might have accidentally fell into the rabbit hole and was being messed with. With all the buzz, I had to check out the Hood Internet website. I found that all the hype was justified. 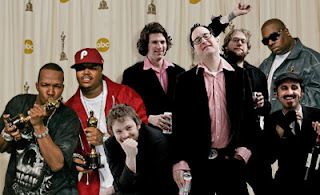 Not only do most of the tracks intertwine perfectly, but there are Photoshopped pictures of these supergroups together (Whats not awkward about Project Pat standing next to The Avalanches?). So even if a Modest Mouse/Lil’ Wayne album doesn’t happen in the near future, at least you can imagine what it would be like if it did.